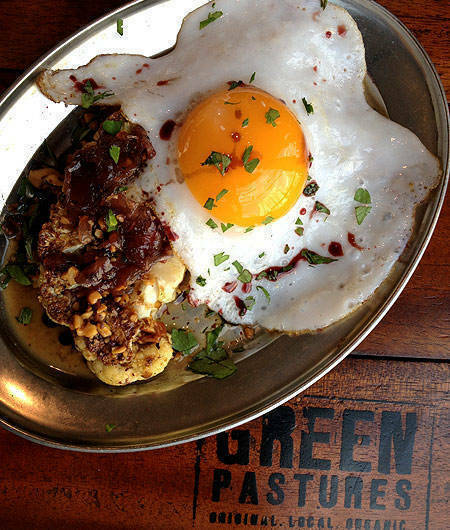 Chef Rob Goco gives us more reasons to tread greener pastures. 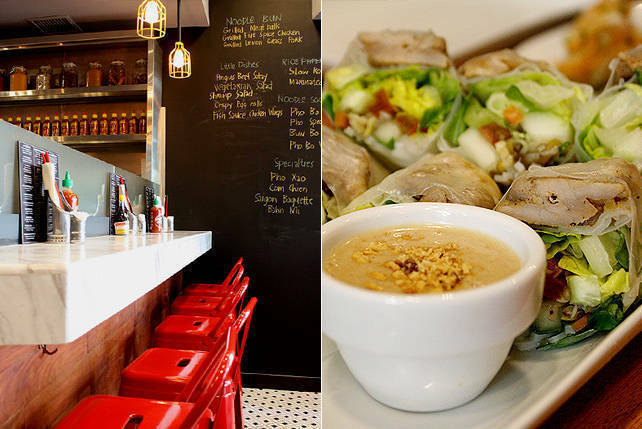 (SPOT.ph) That Green Pastures was the best restaurant of 2013 is a moot point, but there’s no arguing that Chef Robby Goco’s organic eating hub is up there with the best of them. Still, the good chef isn’t known for resting on his laurels and to keep up with the challenge of competition, he comes up with more dishes every month. His solution suits customers well to know that what they put on the plate is nothing less than the season's best organic harvest. "We update our menu every month based on what's in season, what's new, and what's fresh," says Goco who is always on the lookout for good local produce he can utilize. 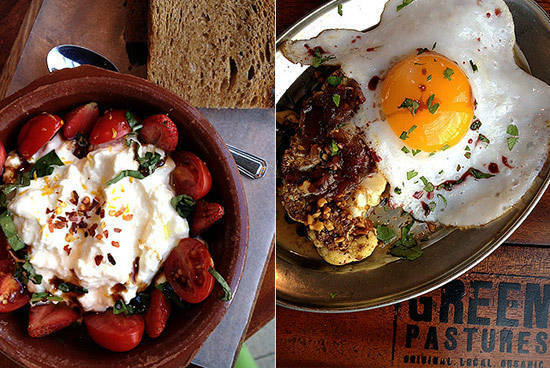 "These (new) dishes will be offered as long as the ingredients are available." Recently, he got his hands on organic strawberries from Benguet and created a signature salad and Burrata (P355). "I met this Italian cheese maker in Bacolod. She sat down with me and told me how to make it." 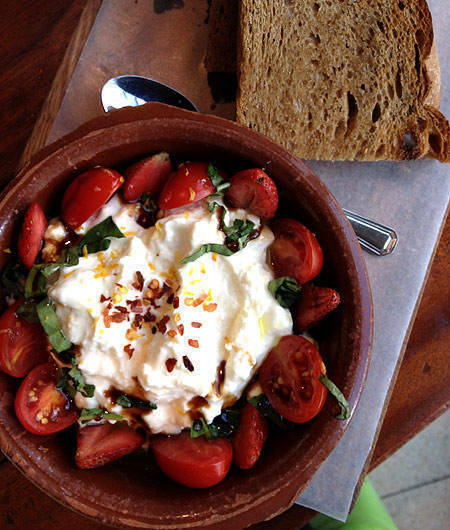 The homemade burrata dish is a mound of stark white cheese with chopped fresh basil, hulled and halved strawberries and grape tomatoes, then drizzled with basil oil and balsamic vinegar and embellished with lemon zest and dried chili flakes. Toasted home-baked bread on the side provides a canvas for the soft cheese. The same cheesemaker also partly inspired the creation of the new Duck Egg Omelette (P200)-she and Goco's recent trip to Europe. 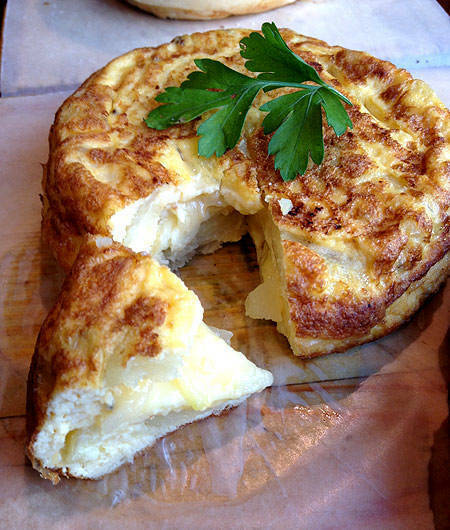 "I just came from Spain and they have what they call the Torta Española and it's something they serve on a daily basis. [The cheese maker] sent me some caciocavallo, a mozzarella-type of cheese that's very flavorful. So I stuffed it inside an omelette." The result is an interesting mix of textures, with a tender bite from the potatoes, chewiness from the onions, and a suave softness from the silky melted cheese. Goco, who constantly updates himself with global food trends, also claims that cauliflower is the new kale. He excitedly shares, "If you fry or roast it, it tastes exactly like chicken. You can also have a gluten-free mash." Goco expresses his elation through mouthwatering innovations. 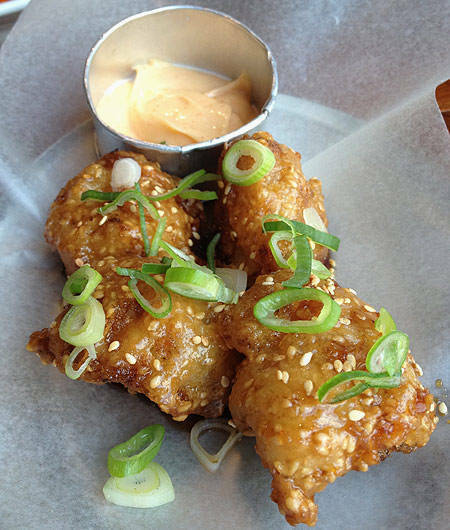 The Korean Fried Cauliflower (P185) comes in the form of four big florets, lightly dipped in batter, fried, then bathed in a sweet glaze. Dab some of the sriracha mayo over it to complement the sweetness with some heat. Then there’s the Cauliflower Steak and Eggs (P185). Here, Chef Rob uses cauliflower to headline a surefire vegetarian hit. A thick and hefty slice of the greens is roasted and emphasized with onion jam, walnut crumbs, beurre noisette (brown butter), and a fried duck egg. He shows off his fun side in the Meat on Meat Classic Cheeseburger (P595). The seemingly plain burger is topped with pickles, red onion, tomatoes, and homemade cheddar cheese, with either sweet potato or potato fries. 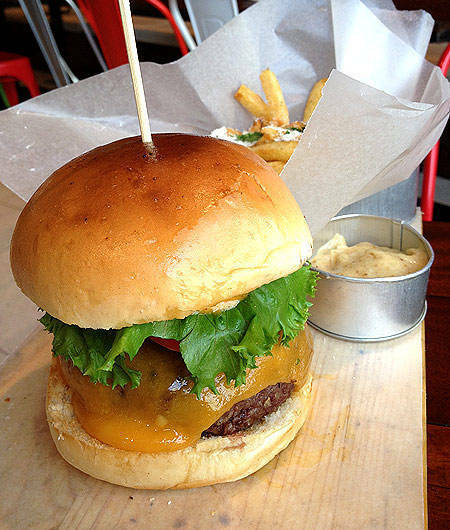 But as with any good burger, the patty is everything. Short rib is put in sous vide for 48 hours and stuffed in between two ground Kitayama Wagyu patties. 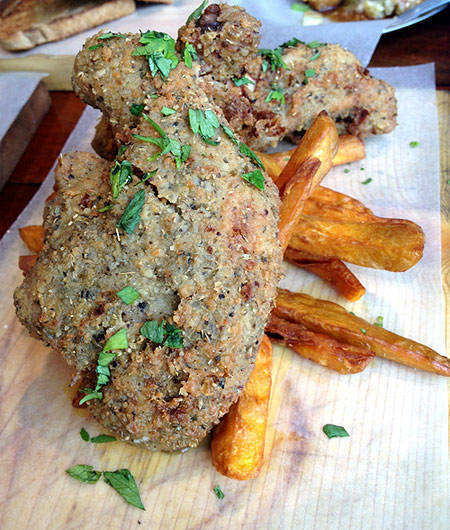 A farmer recently introduced him to probiotic chicken which he then turned into the Duck Fat Fried Chicken (P595). Also cooked in sous vide-but only for 45 minutes in 75 degrees Celsius-this one is breaded then fried to a lovely golden brown. It's moist, tender, and made even more flavorful with the two condiments it comes with-homemade roasted banana ketchup and honey-butter herbes de Provence. The dish is updates a classic, but remembers the comfort that any good fried chicken provides. 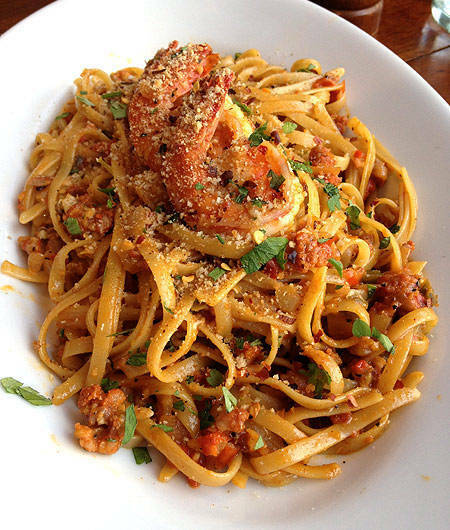 Customers can expect another slew of new dishes next month. Goco hints at beef cheeks and rainbow runners, which is supposedly our rendition of salmon. Next month will be exciting, but it might be hard to get over this month’s specials.